...because of a mistake on my part. We'll invite Melody Balthaser back and feature her book Seeking Sophie on another day. In the mean time, my friend Ashley over at the A to Z blog tagged me in a fun List Of Random Questions created by her friend Naomi. ~ Paste the button onto your blog post. ~Write down three facts about you - one of them is WRONG. Let your commenters guess in the comments which one is wrong (and tell them in the comments after a while). Have you talked to anyone in person about a book this week? What are the two biggest emotional reactions you've gotten from a book or movie this year? What was the last flower mentioned in a book you read? If you could choose to travel to the setting of one of the last three books you read, which would you choose? If you could choose three living authors, to follow around for a day, who would you choose? If you could read only one fiction book for the rest of your life, which would you choose? Anyone else reading this post who wants to! P.S. I know everyone is busy these days, so feel free to pick and choose the questions and/or answer in the comments if you'd rather. #1. I have both an irrational fear and secret dream of being serenaded with a love song in public. #2. I witnessed a man die at a rodeo. #3. I hate straight peanut butter on crackers. 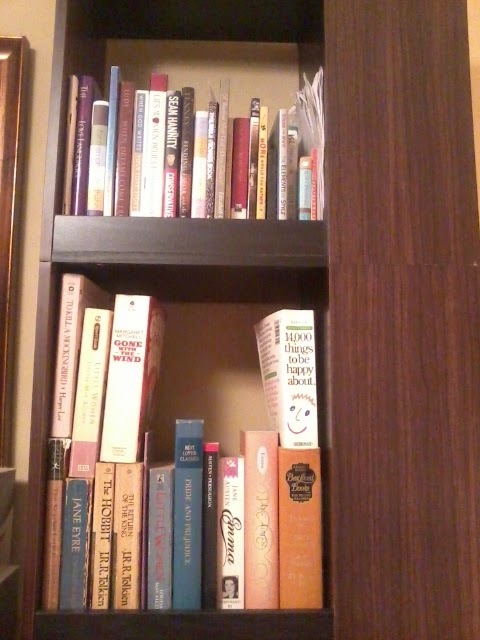 How many books do you have on your bookshelf(eves)? Political, spiritual, and relationship nonfiction on top. Classics on bottom. Top shelf: Most recent acquisitions in random order. 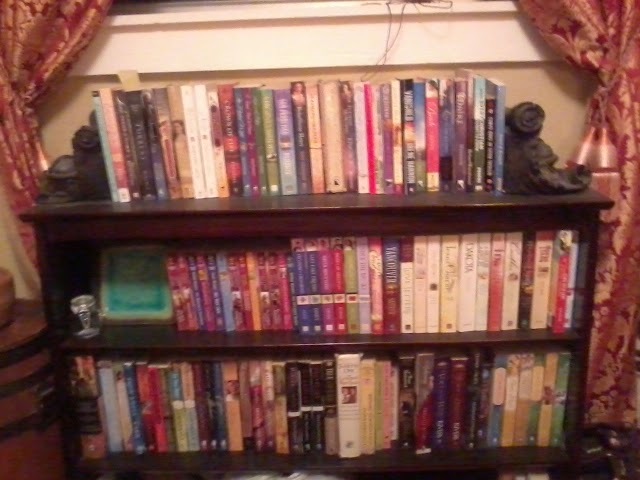 Bottom two shelves: Mostly historical fiction and series' alphabetically arranged by author last name. 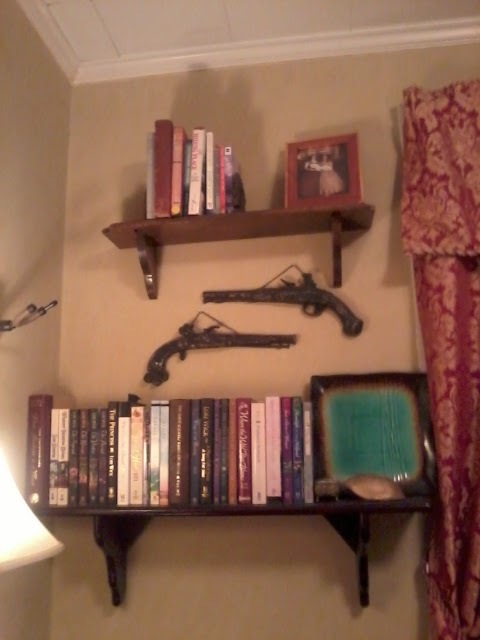 A dvd rack I bought for $1 and turned into a bookshelf. Not the easiest on pages, but I was pressed for space. 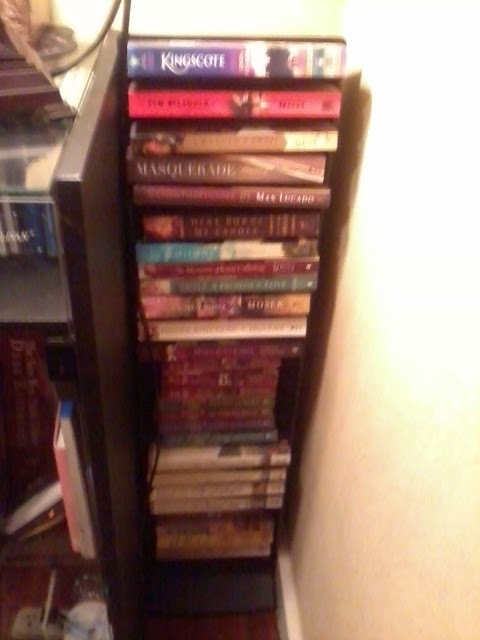 Keepers at bottom and random recent acquisitions about halfway and up. Top shelf: Spiritual classics like A Man Called Peter, The Hiding Place, some C.S. Lewis, and maybe a Spurgeon, not sure. 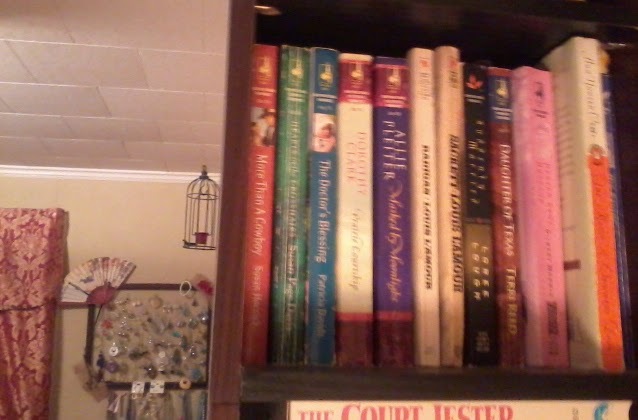 Bottom shelf, beside my golden tortoise shell: my so-dear-to-my-heart Lori Wick collection. These are only my very favorites of hers. I haven't collected the others yet, because of a space dilemma, if you know what I mean. 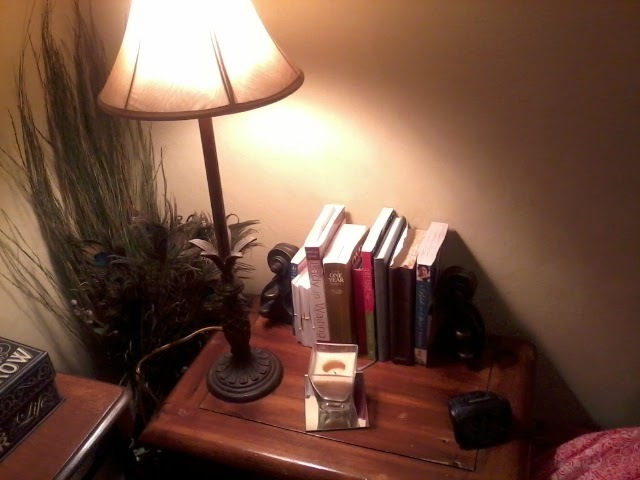 Someday I wish to own a small room with wall-to-wall built in bookshelves, a wing-back chair, lamp, and footstool. And maybe a cat. What's your favorite color? Why? Hmmm. Blue. (Can you tell?) Bright bright blue. Like the color Azure according to Wikipedia. Maybe with a touch more green in it. Are you a Mac or a PC person? iPhone or Android? PC because I don't want to relearn the system (though I technically did when I got this Windows 8.1. LOL). I have a Samsung Flight II. I try to stay away from the phones that need constant updating. Mine lets me talk, text, and send photos to friends, and reminds me about events. That's about all I need. Goodsearch. Each time you search, Goodsearch donates $0.01 to the charity of your choice. Fellowship Tract League and Institute For Creation Research - ICR are two good verified charities. What's your favorite form of social media? Twitter, Instagram, or Facebook? Follow Natalie Monk's board Fashion: Ladies' on Pinterest. What's your favorite singing group? Wow. That's hard to answer. Probably Selah or the Martins. That's like asking me my favorite book. Don't ever ask me that, btw. That question just hurts me. Haha. Do you play an instrument? If so, which one? Piano and fiddle. Six chords on guitar and some nursery songs on an Irish penny whistle. What's the main thing(s) you watch on YouTube? Movie trailers and song lyric videos. I also like period drama mashups and clips of Tim Hawkins. Tavin Dillard of the sweetteafilms channel is pretty funny if you've grown up Southern and can laugh at yourself. I've been known to crack up at a few of the Hannah and Kaylee vids. Do you listen to podcasts? If so, which are your favorite? I can honestly say I don't know what a podcast is. Haha! That's terrible, right? But I listen to a lot of writing webinars, so that's almost the same thing, right? Or wrong? Am I wrong? Thanks, Ashley, for such a fun post! I'm not sure if I was random enough, but there it is. Haha! P.S. Everyone who would like to, take a minute to give me your ideas in the Improvement Questionnaire on the top right sidebar. I would LOVE to get your feedback so I can tailor this blog to you! Thanks for introducing me to Goodsearch! Maxi skirts for the win! My mom just bought me knee-length ones, and boy, are they awesome! Thanks for introducing me to Hannah and Kaylee. They are a riot! I'm pretty sure a webinar and a podcast are close to the same thing? Hmm...I'm going to go with the one about peanut butter crackers. Although I hope you didn't witness a man dying at a rodeo. I LOVE blue. Best. Color. Ever. I can't pick my favorite singers either. I love the Kingdom Heirs, the Gaither's older stuff, Brian Free's older stuff...yeah. Can't choose. Hi, Ashley! Hope you enjoy Goodsearch and Hannah and Kaylee! :) I've heard of the knee-length maxis that they're super cute and comfortable. I'll keep an eye out now! Blue is the best, isn't it? 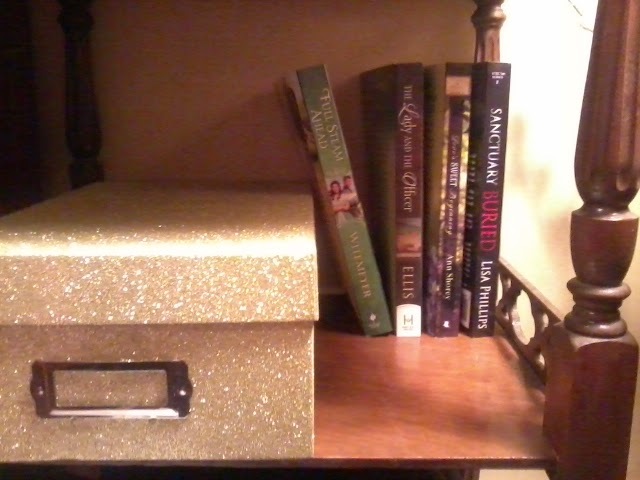 :) I haven't listened to the Kingdom Heirs in forever! I remember seeing them at a show in Dollywood years ago. I'll have to look them up again. Fact #2 is false. Well, mostly. I saw a man who was unresponsive get carried away on a stretcher, but they later reported him as stabilized and receiving medical attention. Ok, I am going to go with #2. I went to a rodeo once, and it was so intense! And I'm going to email you a podcast. :) I made one when I was in college. They are just an informative video for a business, organization, etc. Thanks for the info about Goodsearch too--that is so cool! Hi, englishmysteriesblog! Can't wait to read your answers! Thanks so much for sending me a podcast. It's really time I learned more about the tech world, lol.